The Jawhawks quilt block is a new one to me ... well at least the name. 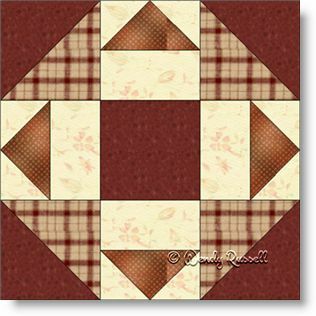 The patches used in this block are easy to create and therefore this block is a good choice for a beginner quilter. The sample quilts illustrated appear to be similar, but one quilt has the blocks set side by side with sashing strips in between and the second quilt features blocks set on point. Any way you choose to lay out the blocks in your quilt will produce a pleasing and unique end product. That is what makes quilting such a fun and creative activity -- rarely do two quilts using the same blocks look the same!